A legendary figure within New Zealand rugby, Bryan Williams is considered one of the greatest players the country has ever produced. 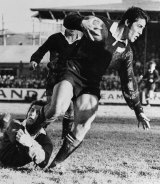 Williams made his name on the All Blacks' tour of South Africa in 1970. He had been mainly used as a centre since breaking into the Auckland side at the age of 18 the year before but was deployed on the wing in South Africa - and to devastating effect, Williams scoring 14 tries in just 13 appearances. He remained a regular in the All Blacks starting XV for another eight years, eventually representing his country on 113 occasions (38 Tests), scoring 66 tries in the process. Williams, who was also a fine goal-kicker, also enjoyed a successful career at provincial level and played in four of Auckland's Ranfurly Shield-winning teams: in 1971 (over Canterbury), in 1972 (over North Auckland), in 1974 (over Wellington) and in 1979 (over North Auckland). He also played his part in Auckland's inaugural NPC first division title triumph in 1982 before retiring to concentrate on his coaching career. He teamed up with Maurice Trapp and enjoyed fantastic success at club and provincial level with Ponsonby and Auckland respectively before becoming closely involved with Manu Samoa in the 90s. Indeed, it was he who masterminded the Polynesians' shock win over Wales at the 1999 World Cup. In 2000 he became assistant coach to Graham Mourie with the Hurricanes and has spent his most recent years coaching Auckland development sides as well as performing an administrative role with Ponsonby.